Since the discovery of gold, various means have been devised and tested to separate the precious metal from the ores containing it. The type of process utilised to extract gold from the ore body is vastly determined by factors such as: the mineralogy of the ore and the degree of liberation of gold particles. The raw ore body is crushed and ground in the attempt to liberate/free as much gold, which could be separated either by a chemical, physical or surface based process. It will be attempted to identitY and provide a brief discussion of the main processes in use. Processes such as cyanidation (chemical process) and mercury amalgamation (based on the surface chemisty of gold) is dealt with in this section. The cyanidation process was patented by JS MacArthur and his co-workers RW Forrest and W Forrest in 1887 and involves the production of gold and/or silver by leaching auriferous and/or argentiferous ores with a weak cyanide solution. In the first step the ore is comminuted by means of crushers and mills to render it more useable by reduction of its particle size and te liberate the one component from another to permit subsequent separation of the valuable component (e.g. gold) from the gangue (Stanley, 1987). In order to enhance gold extraction by cyanidation, the gold grains (or micrograins in some ores) must be fully wetted by the cyanide so that the solid-liquid reaction of leaching takes place, therefore fine grinding of the ore liberates the gold particles and maximises the reaction rate and efficiency of leaching. An ore yielding acceptable gold recoveries (more than 88%) by direct leaching after being ground normally (60-75% -200 mesh). is defined as an amenah:e ore. whereas a refractory ore yields recoveries below 80% if normally ground and needs extremely fine grinding or pre-treatment before being exposed to cyanide (Yannopoulos, 1991). calcium hydroxide, which maintains a protective level of alkalinity (pH 10 to 11 ) (Young, 1987). Many types of leaching operations, such as heap leaching, vat leaching, batch and continuous leaching or a combination of both etc. have been, researched and are in use (Young, 1987 and Yannopoulos, 1991). 11 is not within the scope of this study to investigate the different means of leaching the gold ore, but rather to gain a understanding of the basic concepts concerning the cyanidation process as the leaching circuit is part of the basic operation of the cyanidation process and will vary for each gold operating plant. Once the ore has been ground and leached with the weak cyanide solution, the pregnant solution contains anionic gold cyanide compkxes (Equation I. I). from which the gold must be recovered. One (or a combination) ui the following processes is utilised to recover the gold from the pregnant solution. Continued research is being done and therefore. the abo\’ementioned processes are not the only ones existing, but rather are the most widely used, and will hence be discussed briefly in the following sections. As the chemistry of these processes are very complex and can be treated here only in the barest outline, the reader is referred to works devoted to these subjects for further details, such as Helferrich (1962), Marcus and Kertes (1969) and Nicol et al., 1987.
this sequence would tend to dissolve in cyanide solution more readily than the metal to its right, which explains why zinc displaces gold in a cyanide solution (Yannopoulos, 1991). The overall chemical reaction for cementation was proposed by Barin et at. (1980). Zinc cementation is classified as a Solids-Liquid separation system and involves the separation of the pregnant solution from the leached solids before recovery via Zinc precipitation (cementation). It is vnul that the solids be washed thoroughly to minimize any loss of dissolved gold with lile solids, therefore a counter-current decantation (CCD) series of thickeners is designed to provide solids-liquid separation with thorough washing of the solids. The solids are washed as they flow from the first to the last thickener and the liquid washings overflow and are pumped from the last to the first thickener, counter to the movement of the solids. Clarification of the pregnant cyanide, ‘IS fine solids in suspension may coat the zinc surfaces and reduce its activity. De-aeration. as oxygen causes increased zinc consumption by wasteful side reactions oxidising the zinc (Crowe, 1918). Addition of zinc powder and lead salts, as the formation of a so-called zinc-lead couple simulates the poles of a voltaic cell and hydrogen can be evolved at the lead cathode, thereby reducing the passivation of the zinc surface. Recovery of the zinc-gold precipitate. Zinc dust is added to the de- oxygenated solution as it flows through precipitation filters, which are precoated with 9 diatomaceous earth and a secondary coating of zinc dust. The filters are totally enclosed to safeguard the precious precipitate. [In a few instances, the gold solutions that are eluted from the activated carbon are treated with zinc cementation in stead of electr0winning. It was found that such solutions do not have to be de-aerated, since their oxygen level is very low due to prior hot elution and depressurizing. Activatea carbon is a highly porous material with a very large intraparticulate area per unit of mass, which gives it distinctive adsorptive properties. The recovery of gold from pregnant solutions by activated carbon consists ofthree distinct operations. 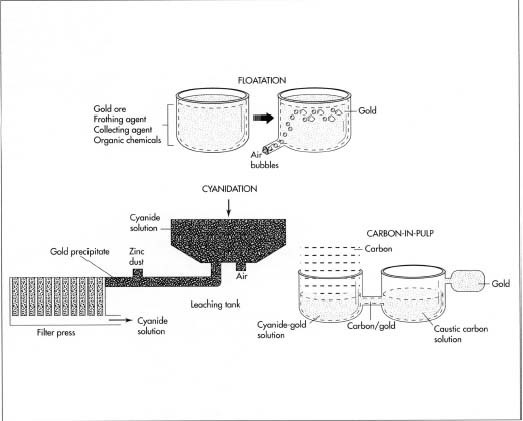 Loading: the adsorption of gold (and/or silver) from solution onto the carbon. 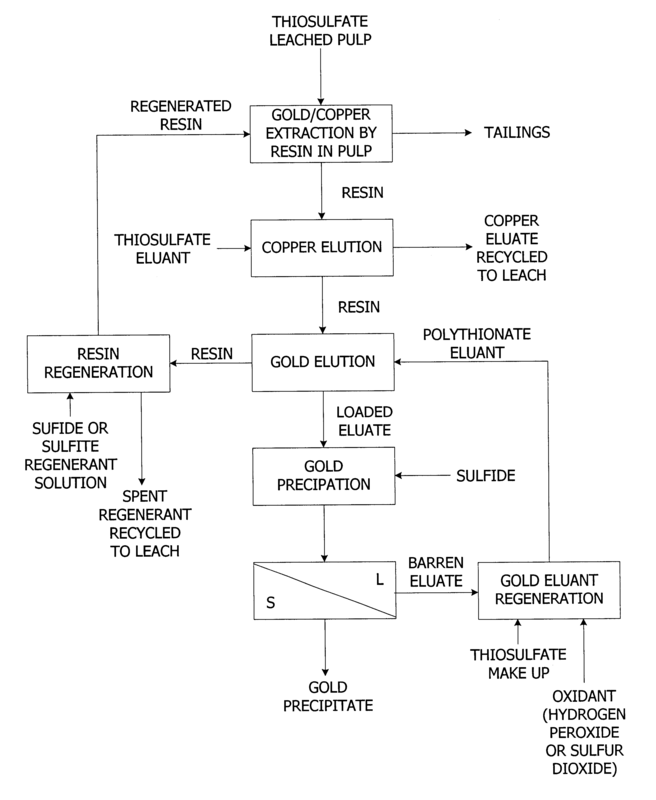 Elution or stripping: desorption of gold (and/or silver) from the carbon. The gold cyanide complex is adsorbed onto activated carbon and is reco\ered from the dilute production solutions where it is delivered as concentrated gold solutions and not as gold metal, therefore the gold is merely desorbed into a more cuncentrated solution. Metallic gold production: Electrowinning or zinc cementation of gold from the concentrated (eluate) solution. More than one system exists whereby activated carbon is loaded and is described by the means of contacting the carbon with the slurry (Figure 1.2). for example, when the activated carbon is mixed with the leached slurry to adsorb the gold from solUlion (in separate tanks), it is named a carbon-in- pulp (CIP) system. When the activated carbon is 10 added to the leaching tanks to adsorb the gold from solution as cyanidation proceeds, it is named a carbon-in-Ieach (CIL) circuit and the carbon-in-column (Clq circuit involves the use of a packed column of activated carbon through which the clarified solutions is passed whereby the gold is adsorbed as they percolate. The crp process is mostly used and preferred means of loading the activated carbon and has always been an economical and effective method for large scale gold and silver metal recovery. The carbon used in the crp circuit is regenerated (before being recycled to the last stage of the adsorption circuit) in order to get rid of the other adsorbed metals and organic contaminants (oils, greases, humic and fulmic acids). which causes carbon fouling and hence, reduces the activity and ability to adsorb. (Van der Merwe, 1991). During the electrowinning procedure, gold metal is recovered by an electrolytic process, whereby the gold deposits onto the cathode. The laden gold cathodes may contain 7075% gold and 10-15% silver, the remaindPf being copper and steel wool. To fire-refine the electrowon gold, a pan is filled with 30% sodium nitrate (reacts to lower the melting temperature of the mix), 40% borax (dissolves the metal oxides and lowers the melting temperature) and 30% silica (combines with borax and contributes to the dissolution of metal oxides), all in percentage of cathode weight. The charge (l: I cathode/flux) is placed in a silicon-carbide crucible in a tilting gas-fired furnace and heated to I 093 QC. After melting, the mixture remains in the crucibles for about 1,5 hours after which it divides into two molten phases, bullion and slag. The slag is then skimmed off and the bullion further refined in clay crucibles (Yannopoulos, 1991).